Understanding the Mean Conjunctions of the Jupiter-Saturn cycle, by Benjamin Dykes. This article presents an adapted excerpt from my recent volume of translations in traditional mundane astrology, Astrology of the World II: Revolutions & History. Within these translations, I have divided traditional techniques into two broad categories: "episodic," and "historical." By episodic, I mean the use of ingress charts, lunations, and eclipses to predict and understand weather, prices, and other things; it is episodic, because in general such charts are viewed in isolation and are relevant only to the period at hand: the period of an eclipse, the weather over the summer. By contrast, historical astrology covers conjunctional theory, time lord systems such as mundane firdaria or something called a "Turn," and ingresses used for political purposes. Here, charts are seen as embedded in longer historical processes. In this article I will focus on a well-known branch of historical astrology, Saturn-Jupiter conjunctions. Many people have heard of these, but there are a number of special features that practitioners need to know before understanding how traditional astrologers used them. 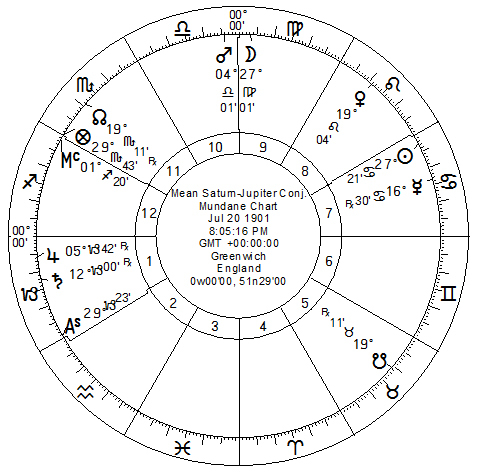 Saturn-Jupiter conjunctions, and their grouping by triplicities, formed the backbone of historical astrology. The basic approach, and the roles the conjunctions played within larger periods like the "world years" were already well in place by the time of Masha'allah; but Abu Ma'shar seems to have been the one who really popularized and regularized the approach followed by astrologers after the 9th Century AD. In order to understand how these conjunctional cycles work, both in theory and practice, we need to introduce some terminology. First of all, the whole apparatus of this conjunctional astrology was structured on mean conjunctions. What is a mean conjunction? Astrologers tend to use "true" conjunctions, which are the conjunctions of the planets as they appear to us. (In Ptolemaic astronomy, a "true" position is one as seen from earth.) Thus, if we see in the ephemeris or a computer program that Saturn and Jupiter are conjoining at 15° Capricorn, we expect to be able to look up in the heavens, and see the actual bodies of the planets together, within the degree of 15° Capricorn. And as we know, sometimes Saturn and Jupiter make three true conjunctions: once when the quicker Jupiter goes past Saturn, then when he retrogrades back across him, and then finally after he goes direct again. In the diagram, Jupiter starts out with the center of his epicycle (his "mean" position) at 0° Aries, and I have assumed that his body itself is also there (his "true" position). As time goes on, the epicycle moves counter-clockwise around the zodiac, as does his own position on it. After 11.86 years, the center of the epicycle reaches 0° Aries again, completing his mean period. But note that because he moves on his epicycle at a different rate, at the end of the mean period his body will have rotated the equivalent of about 308°, not a full circuit. So at the end of the period his true position will appear to be earlier in the zodiac than 0° Aries. From this we can easily see what the definition of a mean conjunction between two planets is: it is the conjunction of the centers of their epicycles. This concept may seem out of date nowadays, but in fact we need this type of astronomy in order to determine when and where to place our Saturn-Jupiter conjunctions within the triplicities. Or rather, we need to know only one of them: after that, we can project the mean conjunctions forward and backward into history and construct our triplicity series. Now, in order to construct a series of mean conjunctions, we need three pieces of information: (1) the type of year and zodiac, whether tropical or sidereal; (2) the length of the mean periods; and (3) the precise time and location of one mean conjunction. Let me discuss each of these in turn, especially since medieval texts often differ from modern values and assumptions. Below I will also provide a table of accurate planetary values, and one may consult Appendices A and B in my book Astrology of the World II: Revolutions & History to see fuller tables of conjunctions and triplicity shifts. (1) Tropical and sidereal years and zodiacs. The tropical year and zodiac refers to the return of the Sun to 0° Aries or the equinoctial point, which is defined as the intersection of the celestial equator and ecliptic. But because the equinoctial points precess "backwards" against the fixed stars, by the time the mean Sun or any planet returns to its tropical position in a given year, it will have traveled slightly less than the full 360° from the previous time. This means that the tropical year, as well as any tropical cycles, will be slightly shorter in time and distance than their sidereal equivalents. Let's look more closely at Jupiter's mean cycle to see how this works, removing the epicycle for the sake of simplicity. In this figure, Jupiter begins his cycle at 0° Aries. The rate of precession is 50.28" per tropical year. So, by the time he approaches his original position 11.86 years later, the point of 0° Aries will have precessed backwards by 9' 56": thus Jupiter's "return" to the new tropical 0° Aries is actually not a full 360°, but 359° 50' 04". Now, in a sidereal year and zodiac there is no precession. Instead, 0° Aries (or whatever point you like) is defined in a fixed way relative to the stars: thus for Jupiter to return to 0° Aries really means moving a full 360°, to precisely the same point. Traveling this extra distance takes more time, so both the distance and time involved is longer in sidereal systems. The sidereal year is about 1.000038804 times longer than a tropical year. In the case of Jupiter, his sidereal period is about 1.9 days longer than the tropical one. Masha'allah, as well as Abu Ma'shar (or at least in his mundane astrology) used a sidereal zodiac. Most medieval Latins, as well as al-Battani, used a tropical one. The choice of zodiac is up to you, but it is important to know that only a sidereal system will yield 12 conjunctions per triplicity - I will return to this below. According to the table, the sidereal year is about 00:20:25 longer than the tropical year. The periods are measured in their respective years, as well. For instance, the tropical period of Jupiter is 11.85677646 tropical years: so, this value multiplied by the length of the tropical year makes his mean period 4330.595 days long. The same can be done with the other values. As we can see, in a tropical system, mean Saturn and Jupiter will conjoin every 19.85929143 tropical years (or 7253.45109 days), what I am calling their "conjunctional period." The sidereal conjunctional period is 19.8585313 sidereal years, or 7253.454917 days, which is a fraction of a day more. 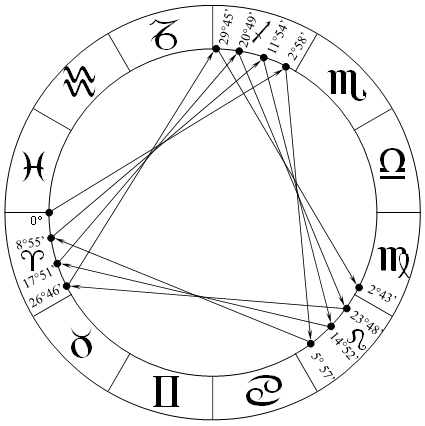 Now, at first this suggests that the choice of zodiacs will affect the conjunctional period. But actually it does not: the planets will conjoin at exactly the same time, no matter what kind of zodiac you use. The conjunctional periods are equal, because the conjunctional period is based purely on the constant rate of the planets. Put differently, look at the length of the tropical period and that of the sidereal period: you will see that the tropical period is slightly longer, but the tropical year is slightly shorter. The reverse is true for the sidereal values. Thus, the longer period of the shorter year (tropical) is equivalent to the shorter period of the longer year (sidereal). The apparent difference between these periods is due to the fact that the NASA website only calculates to 3 decimal places, so when we solve our equations it will seem as though the sidereal period lasts 5.5 minutes longer than the tropical. 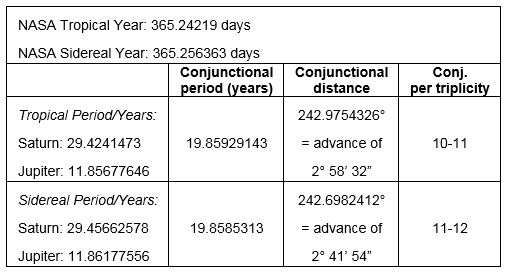 In reality the periods are equal, and if you use this data it will take about 5,184 years or almost 262 mean conjunctions before there is a 1-day difference between them. However, the choice of zodiacs does determine the conjunctional distance. Both systems make each successive conjunction take place in roughly a clockwise or backwards trine from the previous one. In a tropical system, the distance between successive conjunctions is 242.9754323° or 242° 58' 32". Sidereally, the distance is 242.6982412° or 242° 41' 54". To illustrate how these mean conjunctions work, consider figure 5 below. 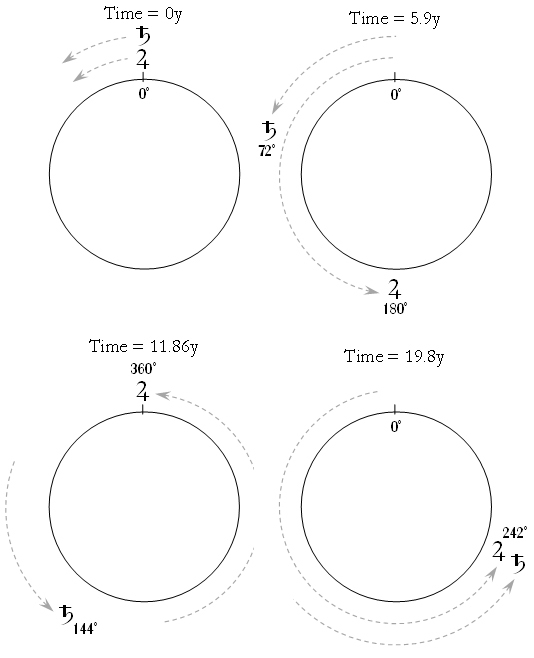 I have removed the epicycles in order to show the idealized mean motion of the planets. 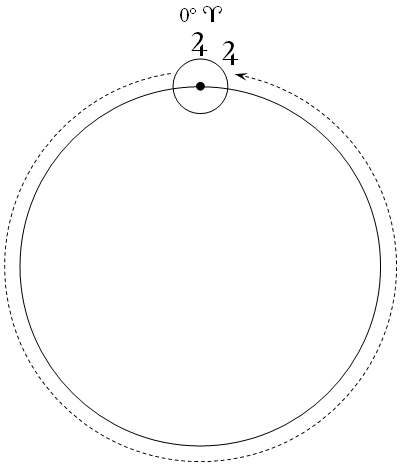 In these figures, the mean positions of Jupiter Saturn (i.e., without their epicycles) begin at some degree (here labeled 0°). After one-half of Jupiter's period (5.9 years), he will have traveled around one-half of the circle (at 180°), while Saturn will have traveled only 72°. When Jupiter completes his period (11.86 years, at 360°), Saturn will only be at 144°. Finally, after about 7.9 years more (or 19.8 total), Saturn will have made it to 242°, where Jupiter finally catches up to him and makes the mean conjunction. The sidereal and tropical values are not the same, but they are so close that the figure illustrates both well enough. Now, earlier I related the standard version of the conjunctional series: every successive conjunction advances by a little over 242°, which is a little less than a backwards trine from the previous position. This means that successive conjunctions will take place within the same triplicity, but because an exact triangle would be 240°, the actual degrees within each sign will slowly advance until the conjunctions enter a new triplicity. The number of mean conjunctions in each triplicity is idealized at 12, but how many are there, really? If there were always exactly 12, then the conjunctional distance could only be 242° 30', advancing by 2° 30' within each sign. Abu Ma'shar's own parameters gave something a bit less: 242° 25' 17": this makes 12 but sometimes 13 conjunctions in each triplicity. Masha'allah's value was 242° 25' 35", also 12-13 conjunctions. The table in figure 4 above shows the accurate values: in a tropical system, there will be 10 or 11 conjunctions, and in a sidereal system 11 or 12. Figure 6 below shows this visually, in the tropical system. Beginning at 0° of some sign for their mean conjunction #1, the tropical series will have 11 conjunctions before shifting into earth for 10 conjunctions. The sidereal series will have 12 conjunctions before shifting into earth for 11 conjunctions. In this way we can see that the idealized system of 12 conjunctions per triplicity is not correct. As a point of interest, I append here Abu Ma'shar's own parameters.2 (Masha'allah's are also given in §6 of my Introduction to Astrology of the World II: Revolutions & History). (3) A recent mean conjunction. As an example, the tropical periods of Saturn and Jupiter dictate that a mean tropical conjunction occurred on July 20, 1901, at 15° 12' Capricorn; but on that day, their true positions were 12° 00' and 5° 42' Capricorn, respectively. Although none of the ancient and medieval astronomers had the more precise values for the year and periods which we have today, you should not think that this difference between mean and true conjunctions was a flaw in the theory itself. Nor are these periods merely rough or approximate: given an accurate length of the year and each of the planets' periods, a mean conjunction can be timed down to the hour or even minute. The regular, mean conjunctions played a structuring role in large spans of historical astrology. (But the fact that the mean and true conjunctions happened at different times and degrees means that we need to make some astrological choices when we cast their charts and make interpretations.) The difficulty in interpreting the calculations in medieval conjunctional theory has more to do with the fact (a) the length of their periods and years were not the same from author to author, and (b) some used tropical periods and a tropical zodiac, others sidereal. In this Appendix I provide accurate tables for selected tropical and sidereal (Fagan-Bradley) mean conjunctions of Saturn and Jupiter. The conjunctions start in 185 BC, with the tropical shift to the watery triplicity. The numbers assigned to the conjunctions, and their Julian and Gregorian dates, are the same in both tables. But the positions of the conjunctions, and which ones count as triplicity shifts in their respective zodiacs, differ accordingly. Note that the position of the conjunctions coincide almost exactly at the triplicity shift to earth in 213 AD. This table was generated by using the following "epoch" date for a recent tropical mean conjunction, and thereafter projecting forwards and backwards using accurate contemporary tropical parameters. Conjunction date: JD 2415585.836, or 8:03 AM, July 20, 1901. Tropical Position: 285.2043109°, or Capricorn 15° 12' 16". 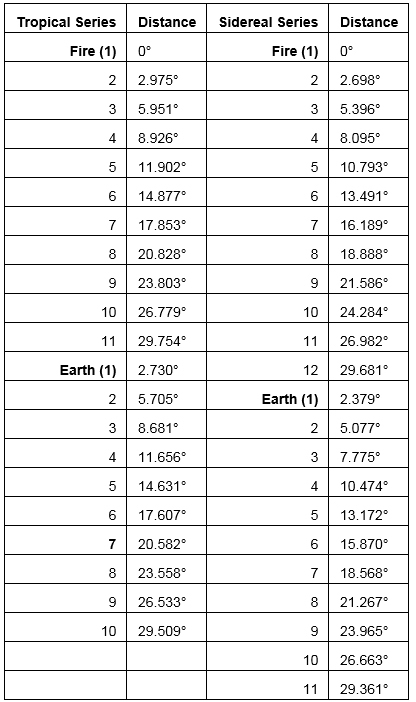 This table was generated by determining the Fagan-Bradley difference between the tropical and sidereal Suns at the mean conjunction on July 20, 1901 (namely, 23° 22' 10"), which put the sidereal mean conjunction at Sagittarius 21° 50' 06". From there, I projected forwards and backwards using the modern parameters I describe within my Introduction to Astrology of the World II: Revolutions & History. Dr. Benjamin Dykes is a leading medieval astrologer and translator who earned his PhD in philosophy from the University of Illinois. He earned his medieval astrology qualification from Robert Zoller and taught philosophy courses at universities in Illinois and Minnesota. Dykes recently published Astrology of the World Vols. 1-2, Traditional Astrology for Today, and The Book of the Nine Judges. In 2015-16 he will be publishing translations from Arabic and Greek. In 2007-08 he translated Guido Bonatti's Book of Astronomy and the Works of Sahl & Masha'allah, on all branches of traditional astrology. Dykes currently offers the Logos & Light philosophy courses on MP3 for astrologers and occultists, and reads charts for clients worldwide. 1 The Jupiter Fact Sheet is available at: nssdc.gsfc.nasa.gov/planetary/factsheet/jupiterfact.html. The Saturn Fact Sheet is at: nssdc.gsfc.nasa.gov/planetary/factsheet/saturnfact.html. Both sheets only calculate the length of the periods and years to 3 decimal points, which is slightly less accurate than one would like. 2 See for example Kennedy 1963, and van der Waerden 1978 (p. 376). 3 The Sidereal year value of 365.259 days, might actually be 365.2590278 days, as with Masha'allah. Kennedy, E.S., "The World-Year of the Persians," in Journal of the American Oriental Society, Vol. 83, No. 3 (Aug. - Sep. 1963), pp. 315-27. Van der Waerden, B.L., "The Great Year in Greek, Persian and Hindu Astronomy," Archive for the History of Exact Sciences, Vol. 18, No. 4 (1978), pp. 359-383. © Benjamin Dykes, published online May 2015.